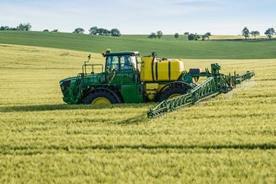 The R4050i is manufactured using the best John Deere designed and purpose built components: carbon fibre booms, PowrSpray™ wet system, John Deere spray nozzles and a 5000 L solution tank for maximum productivity. 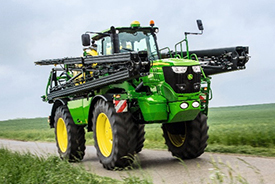 The R4050i travels effortlessly in all field conditions, while a range of intelligent and connected features help optimise your spraying output. Experience the high performance, flexibility and speed of our new spraying champion. The auto air-spring leveling system maintains ride height to ensure 100 mm (3.9 in.) of up and down travel at all times resulting in 200 mm (7.9 in.) of total travel. Once the machine is running, the on-board air compressor automatically inflates the bags to the optimal set ride height to ensure a comfortable ride. XtraFlex strut-type, air-spring leveling system automatically adjusts pressure for optimal field and road performance. XtraFlex is based on individual wheel suspension. The system suspends each wheel separately and provides optimal ground contact, optimal traction, and a comfortable ride. XtraFlex suspension unit slide in/out for track adjustment, steering, and suspension. XtraFlex individual air suspension is unique to the market. The air suspension can be easily lowered using the two-position rotary knob on the operator's station. This reduces the machine height and provides safety when the sprayer is being hauled on a truck or flat-bed trailer. Inflate the air suspension for regular field or transport work and deflate the air suspension for safe transport when hauling the machine on a truck. John Deere FarmSight provides a unique industry-leading solution that combines intelligent machinery, the latest component technology, and a dealer service package. 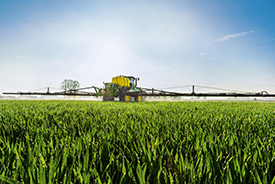 It gives new insights into sprayer operations and the capability to optimize business performance in ways that were simply not possible in the past. MyJohnDeere.com is John Deere’s Ag web portal. It is a platform for products and services that improve machine uptime, logistics management, and agronomic decision making, all housed in a centralized location. 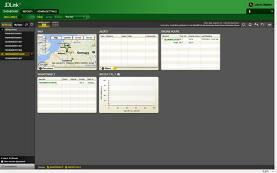 MyJohnDeere.com integrates on-board systems and off-board resources in order to plan, run, and manage a producer’s operation more efficiently through the entire farming cycle. It enables producers to access tools and information making it possible to manage their land and fleet of machines more efficiently. 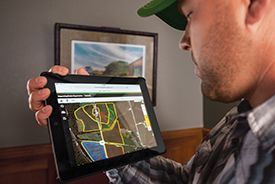 Access to MyJohnDeere.com is possible from any internet-connected device, including a laptop, smartphone, tablet, or desktop computer. 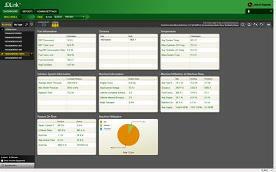 Users log in to their MyJohnDeere.com account to access all pertinent information in a centralized location. This includes access to current applications such as JDLink, JDParts™ database, and the StellarSupport™ portal. Additionally, MyJohnDeere.com hosts new applications such as the operations center, the first place to go in order to monitor the current work status, and my equipment, which gives owners a quick overview of their machines and associated machine capabilities. One login can access all applications. JDLink is John Deere's telematics system designed for producers and managers who desire to take their operations to the next level of productivity and efficiency. JDLink works by combining a 4G Modular Telematics Gateway (MTG) controller that collects and transmits data through cellular communication back to a host system for monitoring and analysis. Using JDLink producers can manage their operations in near real-time without being in the cab. Using the power of JDLink, producers and managers can increase productivity, increase uptime, and reduce cost of operation. They can access JDLink from a laptop, desktop, or mobile device. JDLink provides flexibility to users by offering two levels of subscription: JDLink Select and JDLink Ultimate. NOTE: Mobile device compatibility and functionality varies. Contact a dealer for further details. 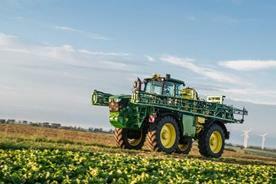 The John Deere R4040i Sprayer features the efficient and powerful PowerTech 6.8-L (415-cu in.) engine (as fitted to 7 Series Tractors). Fitted with a higher-pressure fuel system, four-valve cylinder head, air-to-air cooling and a wastegate turbocharger. 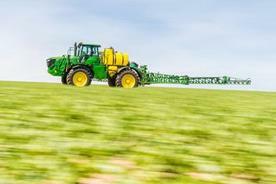 John Deere R4040i and R4050i Sprayers provide ease of use, power, and efficiency in spraying applications. The ergonomic design of the operator’s station makes operation of SolutionCommand easy and convenient. The automated operation limits the risk of mistakes and saves valuable time by efficiently setting up the machine for the job. SolutionCommand speeds up spraying operations with automated settings that make filling, spraying, and rinsing faster, easier, and more accurate. 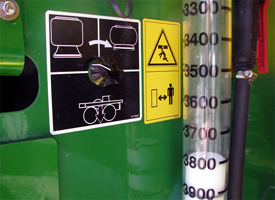 Continual control can be maintained from the operator’s station of the sprayer or by using the GreenStar™ 3 (GS3) 2630 Display in the comfort of the cab. A non-return check valve in the filling system limits system back flow when the suction hose is removed. A smart solution prevents point-source pollution, chemical spillage, and protects the environment. The PowrFill chemical inductor hopper, spray gun, and clothing lockers are all in easy reach. Filters and hose connections are easily accessible and stored behind covers to prevent dirt accumulation. SolutionCommand switches provide instant visibility of the switch’s position at switch panel. Accuracy and filling automation, less risk of mistakes. Select between filling with onboard filling pump or push fill from the operators station. 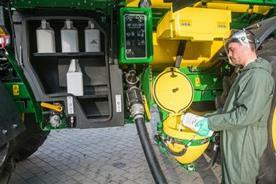 Electric agitation and tank rinse nozzle control from the SolutionCommand panel or inside cab. 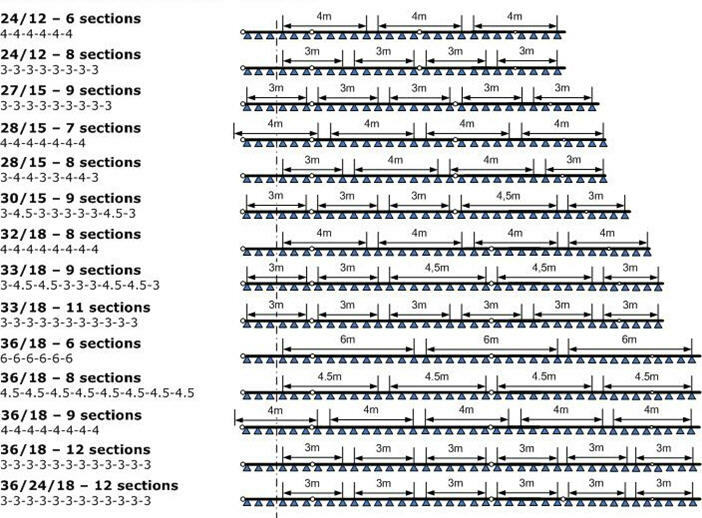 Cycle rinse, dilution calculator, or boom rinse for automated spray system dilution. Higher productivity through faster filling and rinsing. Increase filling performance by increased engine/pump rpm by using the switch at the SolutionCommand panel. The PowrFill chemical inductor is specially designed to handle large volumes product in a short timeframe. A powerful injector quickly draws the crop protection chemicals to the top of the tank, limiting the risk of foaming when loading. The ergonomically-designed operator's station makes operation easy and convenient. SolutionCommand filters and hose connections are protected from dirt and are easily accessible. Once operators get started, setup is easy. The protective clothing locker for storage of safety gear is within easy reach. The PowrFill chemical inductor hopper swings out and is ready to work at the push of a button. The design of the hopper allows easy and convenient handling of different formulations of crop protection chemicals. The overall diameter is approximately 50 cm (19.7 in.) to handle a large number of different package sizes and shapes. Nozzles inside the hopper help prevent powders and granulates building up inside, and the stainless-steel sieve prevents clogging of the injector line. A spray gun is standard equipment to help dissolve products when needed. When filling is completed, protective gloves can be washed using the hand rinsing water supply, the PowrFill inductor can be stowed and protective clothing stored again in the locker, ready to start spraying. An off-center rotating rinsing nozzle allows users to rinse odd-sized packages. Push-down, spring-loaded rinsing nozzle leaves both hands free to hold chemical packages. Clothing locker and spray gun at PowrFill inductor fitted as standard. Integrated 18-L (4.76-gal.) hand wash tank with tap at operator's station. Rinsing head in the inductor lid enables cleaning the inductor inside. 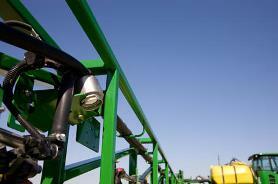 Boom stability is the key to accurate, profitable spraying. If the boom wobbles or swings, the operator reduces productivity, wasting chemicals and losing yields. John Deere’s wide-range durable steel booms have the stability and features operators need for reliable, high-precision performance – year after year. Boom stability solutions enable performance, increase uptime, and reduce cost of operation. When the going gets tough, the pendulum construction with the anti-yaw dampening system balances the spray boom while spraying. For hilly conditions an optional spring set is available to allow the pendulum to better follow the contours of the field. 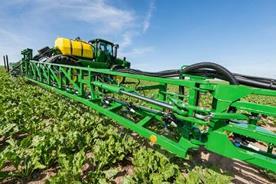 The R4050i offers various spray boom configurations to best match farm value stream requirements. The boom folding sections are fully electro hydraulically operated with the hydro handle using multi-functional control in the cab. Boom folding is typically smooth, due to the ball and socket bearings in the hinge points and the end-stroke dampening in the folding cylinders between the boom segments. Using the Auto Fast Fold Setting, the boom opens the transport lock automatically and unfolds the boom completely. The spray boom also can be unfolded in sequential mode, first inner boom segments followed by the outer boom segments enabling operation at half the working width. In the event the spray boom is unfolded and an obstacle comes up in the field, for example an electric pole, the R4050i offers the ability to reduce the working width asymmetrically using the multi-function lever. By pushing the button, the selected boom segment will fold in and the boom will automatically lock preventing the boom tilting to one side when folded to an asymmetric reduced working width. The powerful 6.8-L (415-cu in.) PowerTech™ PVS engine feeds power to the QuadControl transmission, featuring a single hydrostatic pump, and four fully-variable wheel motors. The R4050i features permanent four-wheel drive (4WD). A cruise control function, together with lower engine speed (1900 erpm), in transport reduces the stress of transporting. The mid-cab design with the operator seated behind the front axle, minimizes on-road bouncing, for comfortable travel. 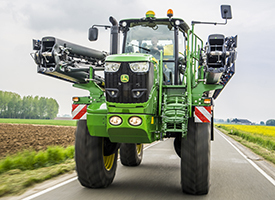 XtraFlex wheel suspension absorbs movements independently at each wheel to keep best contact to the road or field, limiting the movements being transferred into the sprayer main frame. To stay in touch, the GreenStar™ 3 (GS3) 2630 Display and Modular Telematics Gateway (MTG) can be connected to the JDLink™ system for Remote Display Access (RDA) and Wireless Data Transfer (WDT). The spray booms are cradled close to the front, held gently but firmly in position, with rollers to allow fore-aft movement that helps to limit boom wear. The side-folded booms are positioned just above the wheels, keeping the center of gravity low. The low boom transport position also reduces the possibility of damage when driving past trees and offers the operator a clear view in all directions. Powerful 6.8-L (415-cu in.) PowerTech PVS engine to minimize transport time and boost performance. 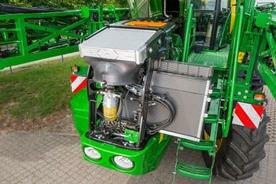 Find machine location and share tasks with JDLink and MyJohnDeere.com. 290-L (76.6 gal.) fuel tank and a 20-L (5.3 gal.) diesel exhaust fluid (DEF) tank keeps the machine productive. 4WD with mechanical final drives for efficient power transfer to the wheels. QuadControl transmission with cruise control functionality, electrohydraulic control, and easy speed selection using the hydro handle. XtraFlex individual dual-strut air-spring suspension, including automatic pressure adjustment absorbs movements on field and road. Booms cradled at the front in transport, gently but firmly, with lateral movement allowed, limit wear in transport. Side-folded booms lower the center point of gravity in transport mode for added stability. Mid-cab design weight split in transport mode (full tanks*): front axle is 52 percent and rear axle is 48 percent Steps for access to the platform and cab lower and rise automatically. Wheel fenders or optional mud flaps protect the machine against dirt. A large storage box allows operators to take additional product to the field for refilling. All crop protection material is stored behind the lockable door, which allows safe storage of different types of packages. An optional filling hose enables operators to fill the sprayer at different locations to reduce the logistic time between farm and field. NOTE: Hauling crop protection material and filling the machine with surface water is only applicable where legally allowed. Product storage box with lockable door. Product storage box is easily accessed from ground level and located near PowrFill inductor and solution control panel. 9-m (29-ft), (3-in.) filling hose for filling at remote filling location. Stainless-steel filter fitted to filling hose prevents debris entering during filling. Floater on filling hose prevents filter sinking too deep during filling. Keep crop protection cost under control: intelligent solutions reduce input cost and enable increased productivity. 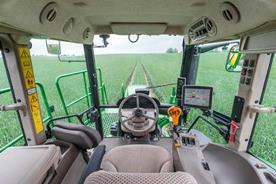 AutoTrac guides your sprayer automatically through the field. Headland Management System (HMS) with control of four-wheel steering helps manage the headland turn easily. Automatic section control is our solution to optimize crop protection quality and reduce input costs. TerrainControl Pro automatic boom control adjusts boom tilt and boom height. With TerrainCommand Pro Variable Geometry is also controlled, to optimize spray boom position in various field circumstances. Light-emitting diode (LED) work lights illuminate the spray pattern providing the visibility you need to get the job done after dark. The spray process can be automatically documented using the GreenStar™ 3 2630 Display. 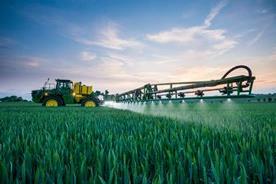 All intelligent solutions collectively working together boost productivity and extend the available spray window. 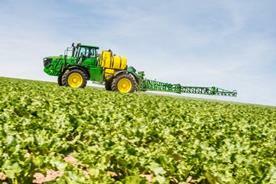 Integrated John Deere solutions can be relied upon spray task after spray task. 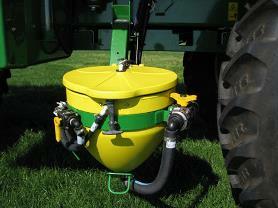 AutoTrac guides the sprayer, reduces overlap, and skips to save on input costs. John Deere Automatic Section Control switches the boom sections automatically on/off in predefined areas to reduce overlaps and skips, further reducing input cost. GreenStar 3 2630 Display offers integrated spray control, provides spray to map (prescription mapping) ability, and both field and spray process documentation. FarmSight™and JDLink for Wireless Data Transfer (WDT) and Remote Display Access (RDA) save valuable time. 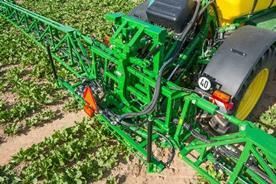 HMS mode links Section Control and master spray switching to four-wheel steering, minimizing crop damage. In HMS, with master spray switch on, sprayer is in two-wheel steer; with master spray switch off, four-wheel steering is engaged. SolutionCommand automation delivers superior control during filling, spraying, and rinsing. Enable night spraying with LED boom working lights to illuminate the spray pattern. Halogen or high-intensity discharge (HID) working lights for increased spray window after dark. Nothing is more annoying than an unstable boom ride, especially in high-speed operations or spraying in hilly fields. 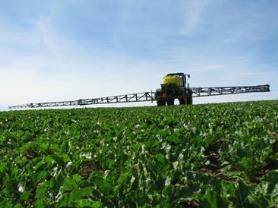 To achieve perfect spray distribution it’s important that the spray boom follows the contours of the field. 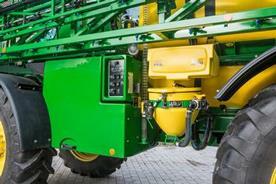 John Deere offers the R4050i with a choice two different automatic control systems. TerrainControl Pro automatically controls the boom height and boom tilt, based on the selected field circumstances. To follow contours of the field TerrainControl Pro manages the boom position by tilting the entire boom and controls the height by adjusting the parallelogram lift system. It is controlled via the GreenStar 3 2630 Display. TerrainCommand Pro automatically controls the boom height and variable geometry, allowing the boom wings to independently follow the contours of hilly and undulating fields. 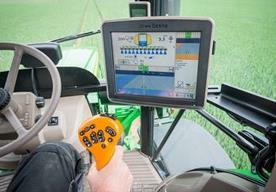 The system is also setup and operated using the GreenStar 3 2630 Display. The R4050i features a mid-cab design, with the operator’s seat located behind the centerline of the front axle. This placement transfers less movement of the front suspension to the operator position, providing a smoother, safer, and more comfortable ride. The mid-cab design allows operators to spray faster and increase productivity in a convenient working environment. 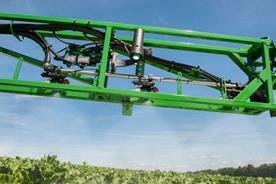 In addition, the mid-cab position offers increased visibility - both to the boom while spraying and in transport mode. 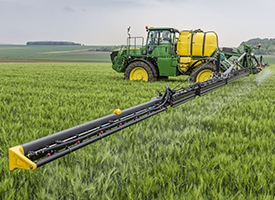 Sprayers can be optionally equipped with intelligent solutions like AutoTrac™ guidance system, TerrainControl Pro or TerrainCommand Pro automatic boom controls, John Deere Section Control, and light-emitting diode (LED) lights. The machine is JDLink™ capable, which enables features such as John Deere Wireless Data Transfer (WDT), Service ADVISOR™ Remote, and Remote Display Access (RDA). 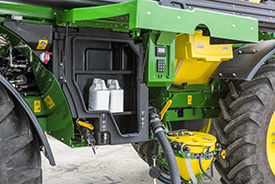 These integrated solutions align with the John Deere FarmSight™ strategy, enabling additional uptime and reduced cost of operation. With these features, operators will be able to work longer hours, increasing the ability to get more hectares sprayed in a day. 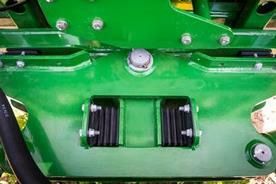 Mid-cab design leverages from the John Deere U.S. models for comfortable high speed application. Mid-cab design offers the perfect position in late season, tall-crop application. Mid-cab design offers a safe and comfortable transport position. Weight split in transport mode (full tanks*): front axle is 58 percent and rear axle is 42 percent. Weight split in spray mode (at 50-cm [19.7-in.] boom height, full tanks*): front axle is 42 percent and rear axle is 58 percent. John Deere’s mid-cab design offers operators a comfortable driving position, even at high spray speeds. While driving, the mid-cab design enables a full picture of the spraying process, including an indication of the front wheel direction. The CommandARM™ controls, including the multifunctional hydro handle, put the operator in control. The GreenStar™ 3 (GS3) 2630 Display and primary display unit (PDU) cornerpost display are available within an arm’s length and address all the imported spray information at a glance. The spacious cab offers a comfortable working space by using adjustable steering wheel and seat position. Operator interface using the multifunctional hydro handle for machine operation.